This article is about the Sega Master System game. 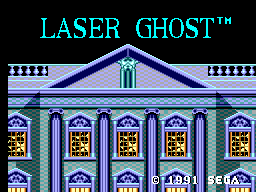 For the Sega System 18 game, see Laser Ghost (System 18). Laser Ghost (Master System) is a Sega Master System shoot-'em-up. It is designed for use with the Light Phaser, but can also be played with a control pad. Player is an unnamed Ghost Hunter armed with a prototype energy weapon capable of hurting ghosts and other nightmarish creatures. After telepathically contacted by Catherine, a little girl who was kidnapped by ghosts and her soul was stolen, player assists her escape from the Ghost City, a nightmarish city only appears once in thirteen years. Player must protect Catherine from harm and help her escape from the city before her soul is lost forever. Some has been suggested that Catherine is the same person as the Kate from the House of the Dead IV, but this hasn't been confirmed. Laser Ghost is a rail shooting game. It can be played with either control pad or with Light Phaser/Control Pad combination. Light Phaser trigger or button 1 can be used to fire main weapon while button 2 (or either button if light phaser is used) fire a special weapon that damages all enemies on the screen. Since Light Phaser has only one button, special weapons must be fire with the Control Pad which must be attached to the second control port. Players must eliminate any enemies from touching Catherine and each hit she is hit, her life will go down. Status screen from left to right: Score, Catherine's lifebar, Catherine's destination to the end of level (above the lifebar), remaining time and number of special shots. Players can also hit Catherine. This will hurt her but can occasionally be useful to get her out of the harm's way. Catherine is held at the dungeon of a mansion. Guide poor Catherine as she attempts to find her way through the dark corridors. Look out for bats, trap walls, possessed suits of armor and other traps. Look for a secret treasure room to recover supplies. Now outside the dark dungeon, Catherine must escape from the manor proper. Again, keep your eyes open for bats. Shoot the "poltergeisted" (is that a word?) furniture and possessed pictures. At the end of the level, you will face a large haunted portrait who will attack Catherine with enchanted fire bolts. Cursed mansion is left behind but Catherine must still reach the city to escape. Unfortunately for her (and you) her path passes through a dark and ominious forest. Keep your eyes open for evil spirits, cannibalistic fruit and of course, bats. Limited supplies can be found inside the gravestones. Defeat a large number of zombies at the end of the level to reach the next part. Stay away from the water. Catherine will be forced to deal with, evil spirits, water creatures who will attack from the river, monstrous fruit and again, bats. End of level boss is a couple of giant, dismembered hands. Most difficult level of the game. Which is understandable considering the fact that you are waltzing through a city infested by demons. Careful when passing near derelict buildings unless you want Catherine to become a street pizza from the falling boulders. Fight back possessed, demonic cars and prepare for air defence against bats, who will know swoop down on Catherine like fighter squadrons. You must reach the hotel. You have entered the hotel, which contains the dimensional gate that will help Catherine go back home. Shoot cyclopic receptionist who will attack Catherine with their eyes. Be on the lookout for spectres who will stalk Catherine throughout the level. Demolish hanged corpses who will use disguisting flies to hurt the poor girl under your protection. You must persevere and reach room 1313. End is near. Your final obstacle is a possessed woman who seems to be a send-off to 1972 movie, The Exorcist. You must shoot all demonic faces appear in the background before they disappear or else the final boss will hit the Catherine with an unstoppable attack. Main article: Laser Ghost (Master System)/Magazine articles.